of either buying blocks for construction or moulding it on their own. When the conditions are right, builders will prefer to mould their own blocks, especially for the purpose of controlling the quality of the blocks moulded, and to ease the cost of transportation. Let us assume that you have decided to mould your own blocks, and you have been faced with the challenge of estimating the quantity of cement and sand to purchase that will satisfy the construction requirement. This post (which is merely informative and not normative) will give you a guide on how to make such estimate. I am going to work it through steps, so that you will be able to make calculations just in case you are using any other size of block. The volume of 1 bag of cement is 34.72 litres = 0.03472m3. The volume of a standard builder’s wheel barrow is 0.065 m3 (unheaped). We assume that approximately 2 bags of cement will fill one builder's wheel barrow. Now, we can estimate the number of wheel barrow trips of sand that the moulder should provide in order to make 35 blocks from one bag of cement. If 0.46728 m3 of sand is required to make 35 blocks, therefore, 41 m3 of sand (about 67.60 tonnes assuming density of dry sand = 1600 kg/m3) is needed to make 3000 blocks. For a 5 tonne tipper of 3.8 m3 capacity, we have to order for 11 trips of sharp sand. You have to be very sure of the size of the tipper that will be delivering the sand to you in order to make your estimates more reasonable. On the other hand, you can make the considerations for variations between the weight of materials when wet and when dry. However, this will never be critical for block moulding based on experience. But in concrete it can be very considerable. 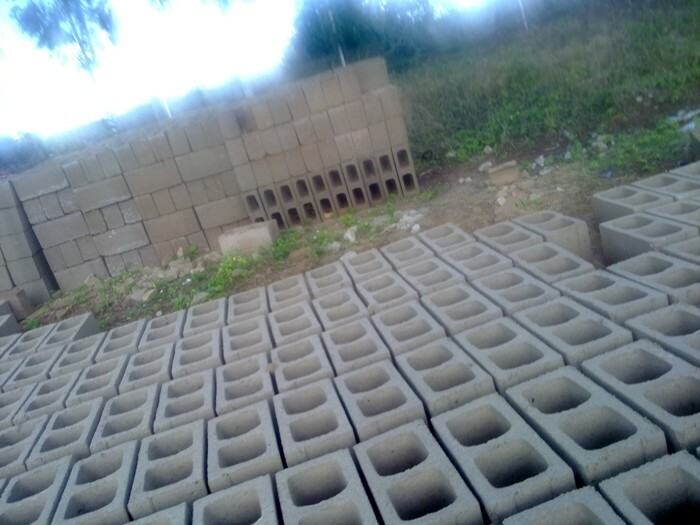 Therefore summarily, we need 86 bags of cement and 11 trips of sand to mould about 3000 pieces of 9 inches blocks with holes (for 1 bag = 35 blocks). Very nice and simile accurate analysis. Thank you very much. Please whats the total cost for 3 bed, 2bed and 1 bed building? • Hi! I'm at work browsing your blog from my new apple iphone!